Raumfahrt+Astronomie-Blog von CENAP - Blog: Astronomie - Why is massive star formation quenched in galaxy centers? A study led by a researcher at the IAC and published today in Nature Astronomy points to the role of the magnetic field as responsible for decelerating the formation of massive stars in the center of galaxies. Without this process the Big Bang would be questioned. Magnetic fields control the collapse of the molecular clouds in the nuclear ring of the galaxy NGC 1097. As a result, formation of massive stars is suppressed in zones of strong magnetic fields (contours). Credit: Gabriel Pérez, SMM (IAC). The current cosmological model to explain our universe, the “Big Bang” model, aims to describe all the phenomena we observe, which includes the galaxies and their evolution from earliest times to the present day. One of the major problems faced by the standard form of this model is that it has predicted a star formation rate –speed at which new stars are born- which is far too big. All the star forming material in galaxies should have been turned into stars when the universe had only a fraction of its present age, 13,8 billion years. However, over half the galaxies we see, mainly the spirals, are very actively forming stars right now. This discrepancy between theoretical prediction and observation has forced to look much more closely at processes which can slow down the rate of star formation during the lifetimes of galaxies, collectively known as “star formation quenching”. Without quenching the standard Big Bang model fails to predict the universe as we know it. There have been a number of mechanisms proposed for quenching, for example “feedback” from supernovae or active galactic nuclei which breaks up the star forming clouds and reduces the star formation rate, but the measurement and verification of yet other possible processes is of great importance. One of this mechanisms has just been published in Nature Astronomy led by the Instituto de Astrofísica de Canarias (IAC) researcher,Fatemeh Tabatabaei. 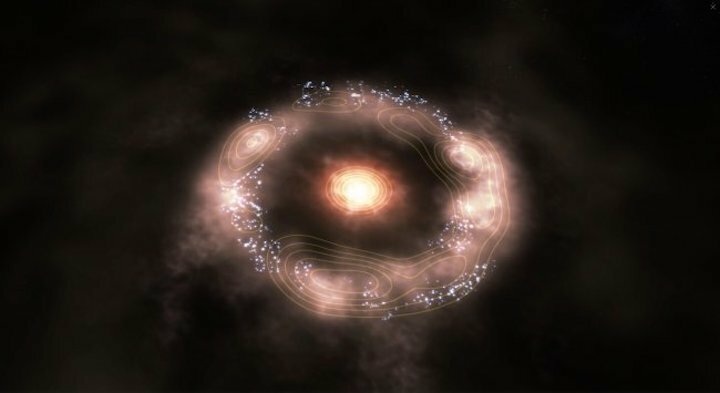 The study points to magnetic fields and cosmic rays as responsible for massive stars forming slowly. Studying in great detail the star formation parameters of the central region of the spiral galaxy NGC 1097, they concluded that the presence of a relatively large magnetic field is acting as a quenching agent, due to a magnetic field that exerts a pressure within a gas cloud which can slow down or stop its tendency to collapse and form stars. But the results have gone further, because researchers have shown that this mechanism is in fact working around the center of NGC 1097. They combined observations in the visible and the near infrared from the Hubble Space Telescope with radio observations from the Very Large Array and the Submillimeter Array to explore the effect of the turbulence, stellar radiation, and magnetic field on massive star formation in the galaxy's nuclear ring. This ring contains a number of clearly distinct zones where stars are forming inside huge molecular cloud complexes. The principal result they obtained was an inverse relation between the star formation rate in a given molecular cloud and the magnetic field within it: the larger the field the slower is the star formation rate. “To do this, we made a specific separation of the magnetic field and its energy from other sources of energy in the interstellar medium, which are the thermal energy, and the general non-thermal but non-magnetic energy” explains Fatemeh Tabatabaei. “Only by combining the high quality observations at very different wavelengths could we do this and when we separated these energy sources the effect of the magnetic field was surprisingly clear”. Almudena Prieto, another of the authors adds in the same sense: “although I have been working on the central zone of NGC 1097 at optical and infrared wavelengths for some time, only when we took into account the magnetic field could we realize its relevance in decreasing the rate at which stars are formed”. This result has several interesting consequences and throws light on several types of interrelated astrophysical puzzles. Firstly, as the magnetic field does not allow very large molecular clouds to collapse and form stars, star formation can occur only after the clouds break up into smaller clouds. This means that this region will have a higher fraction of low-mass stars than in other zones of the galaxy. The tendency of very massive galaxies to contain a high fraction of low-mass stars at their centers is a recent discovery, and is still in some ways controversial, but is reinforced by the work reported here. Also of interest is the fact that the presence of supermassive black holes in the centers of galaxies does tend to enhance the nuclear magnetic field, so that this quenching mechanism should be most effective in the bulges of galaxies.